Abbott reported record-high worldwide Diabetes Care revenue of $530 million in 4Q18, up 28% YOY as reported (+32% operational) on a very tough comparison to 33% YOY growth in 4Q17. Sequentially, global sales increased a modest 4% from the previous record of $512 million in 3Q18. Full-year 2018 Diabetes Care sales totaled $1.9 billion, accelerating to a remarkable 37% reported growth (+35% operational) on a tough comparison to 24% growth in 2017. The international market still leads Diabetes Care (and Libre) sales, accounting for 63% of YOY growth in Q4. Record-high OUS revenue of $395 million in 4Q18 rose 23% YOY as reported (+28% operational) on a very tough comparison (+44% in 4Q17). Record-high US revenue of $135 million increased a stronger 47% YOY (from a much lower base), though on an easier comparison (+6% in 4Q17). In line with JPM, CEO Mr. Miles White confirmed that FreeStyle Libre 2018 revenue totaled “over $1 billion,” more than doubling YOY. There are now “approximately 1.3 million active FreeStyle Libre users” worldwide, an impressive ~30% sequential gain from “over 1 million users” in November’s update. The previous patient split was maintained: roughly two-thirds of FreeStyle Libre users are type 1s, implying the remaining one-third (~425,000 users) have type 2 diabetes. The call shared clear commitment to further expanding into type 2 and ensuring that FreeStyle Libre is accessible and affordable to all. During Q&A, Mr. White commented that FreeStyle Libre 2 “should come to the US shortly,” but provided no further detail. He separately noted the FreeStyle Libre 2 European launch began “during the fourth quarter,” as expected following EASD. It’s unclear whether the Bluetooth-enabled version of Libre with optional hypo/hyperglycemia threshold alarms has launched beyond Germany (confirmed at JPM), or if Mr. White was referring to German availability only. Abbott reported 4Q18 financial results in a call this morning led by CEO Mr. Miles White, headlined by >$1 billion in 2018 FreeStyle Libre revenue and ~1.3 million active users. Get the press release here, listen to the webcast here, and download the earnings infographic here. See below for our top takeaways and userbase/revenue growth charts below. Maintaining tremendous growth, CEO Mr. Miles White shared that FreeStyle Libre now has “approximately 1.3 million active users” globally, reflecting ~30% sequential growth from “over 1 million” users in 3Q18. In keeping with previous comments, Mr. White estimated that roughly two-thirds of these users have type 1 diabetes, with the remaining one-third (~425,000 users) living with type 2 diabetes. As Mr. White noted, the ~300,000 FreeStyle Libre sequential user base increase is almost as large as Dexcom’s estimated global installed userbase of ~400,000 as of our last estimate at JPM. While quarterly sales for FreeStyle Libre were not broken out like in 3Q18 (>$330 million), Mr. White confirmed that Libre hauled in “over $1 billion” in annual sales, representing YOY growth of over 100% and in line with JPM expectations. Assuming full-year FreeStyle Libre sales were roughly ~$1.1-1.2 billion, that accounts for ~61% of total Diabetes Care revenue. We estimate roughly ~200,000-300,000 US FreeStyle Libre users and ~1-1.1 million international FreeStyle Libre users. We’ll return with more specific estimates on FreeStyle Libre sales for Q4, as our previous model assumptions are not backing out into reasonable numbers at this point. Although Mr. White did not share 2019 US FreeStyle Libre revenue guidance, he noted that awareness has ramped up, particularly due to continued increase in pharmacy insurance coverage, as well as an “emerging trend” of FreeStyle Libre achieving preferred copay status. Later in Q&A, management clarified that “certain payers were starting to put Libre in a higher tier, tier two, which would result for the end-patient in having a lower copay.” Per usual, Mr. White optimistically expects FreeStyle Libre to be “a significant growth driver for years to come” and foresees “a significant quantum of capacity to come online in 2H19.” We continue to be impressed with Abbott’s mission of ensuring widespread access to FreeStyle Libre, including the type 2 population. As Mr. White put it: “our intent is to serve the entire diabetic community and not niche it. We target both segments, type 1 diabetes and type 2 diabetes. We’re doing very well in type 1 diabetes, and as capacity expands, we’ll put even more effort into type 2 diabetes.” For more quotes from Mr. White on FreeStyle Libre’s value proposition and expected expansion, see below. Abbott’s worldwide Diabetes Care sales totaled a record-high $530 million in 4Q18, up 28% YOY as reported and 32% operationally. This performance came on a tough comparison to 33% YOY growth as reported in 4Q17. 4Q18 breaks Abbott’s previous four-quarter streak of >30% YOY growth, although if we’re counting operational growth, Q4 marks five such quarters. (Plus, the base is getting quite big here!) On a sequential basis, global Diabetes Care sales climbed a solid 4% from the previous record revenue of $512 million in 3Q18. Will Abbott’s US FreeStyle Libre business start to catch up to the OUS business? This marks three straight quarters of faster YOY growth in the US, though there is still a significant $360 million delta between the geographies. The nice growth in US was presumably helped by the November FDA approval of LibreLink for Apple iOS, the app that allows users to scan their Libre sensors with an iPhone to see their glucose readings. On the other hand, will the recent FreeStyle Libre 2 launch in Europe accelerate OUS sales? Abbott still has strong competition in the US and globally with Dexcom’s factory-calibrated G6, which is more competitive with Libre relative to G5. Full-year 2018 worldwide Diabetes Care sales totaled an impressive $1.9 billion, up 37% as reported (+35% operational) and accelerating from already-tough 24% growth in 2017. 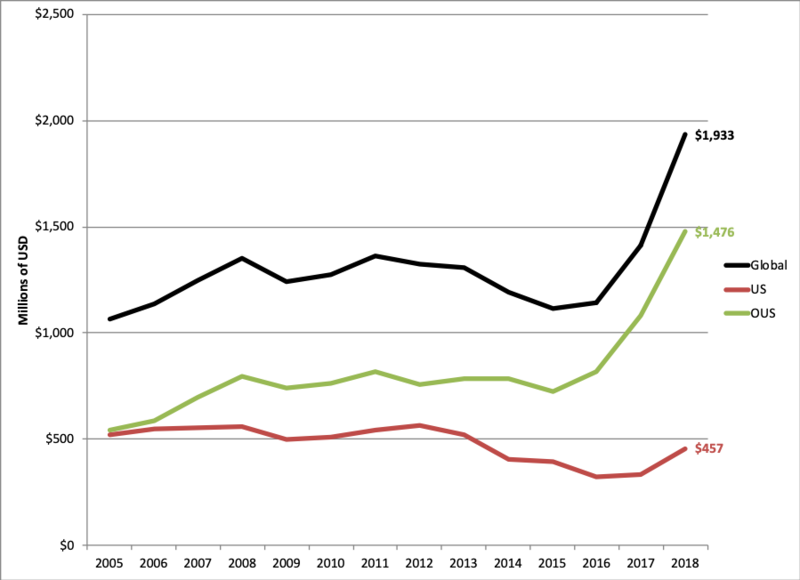 Assuming FreeStyle Libre came in at ~$1.1-1.2 billion in sales in 2018, that accounts for ~61% of total Diabetes Care revenue, leaving ~$700 million in BGM revenue. Looking at the graph below, it’s truly amazing to see how sales have shot up since 2015, increasing by over 70% in just four years. Record-high Diabetes Care international sales of $395 million rose 23% YOY as reported (+28% operational) on a very tough comparison to 44% YOY growth in 4Q17. Sequentially, sales climbed a more modest 2% from the previous record revenue of $388 million, reflecting seven straight quarters of consecutive sequential growth. 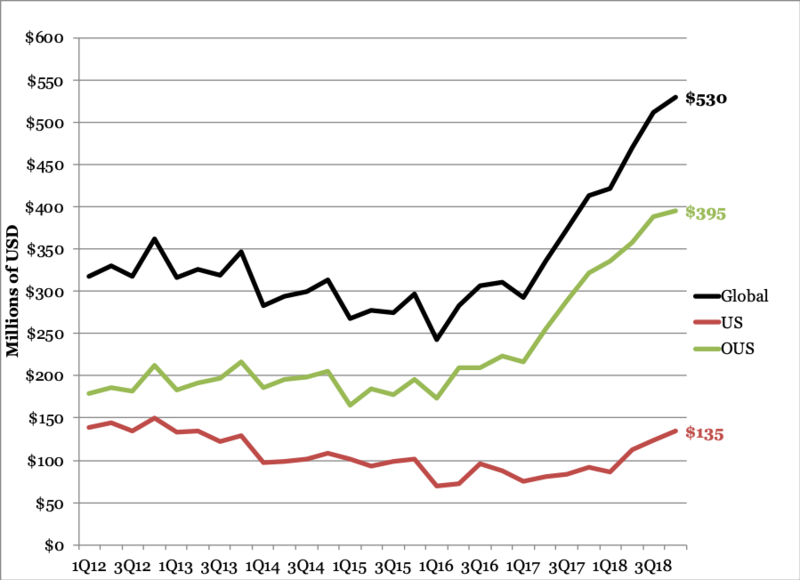 The milder increase is probably mostly due to the larger base of sales, and perhaps some impact from Dexcom G6’s European launch (14 countries as of Dexcom’s 3Q18 call). We suspect that the recent FreeStyle Libre 2 launch in Germany to be followed by a “gradual European rollout” will drive greater competition between Dexcom and Abbott, as FreeStyle Libre 2 offers alarms (to compete with G6), and Dexcom has no required receiver OUS (to compete with FreeStyle Libre). 2018 international Diabetes Care sales totaled a record-high $1.5 billion, up 36% YOY as reported (+34% operational) on a tough comparison to 32% growth in 2017. Full-year OUS revenue has now seen positive growth for three consecutive years, climbing over 80% since 2016. US Diabetes Care revenue rose 47% YOY to a record-high $135 million in 4Q18. 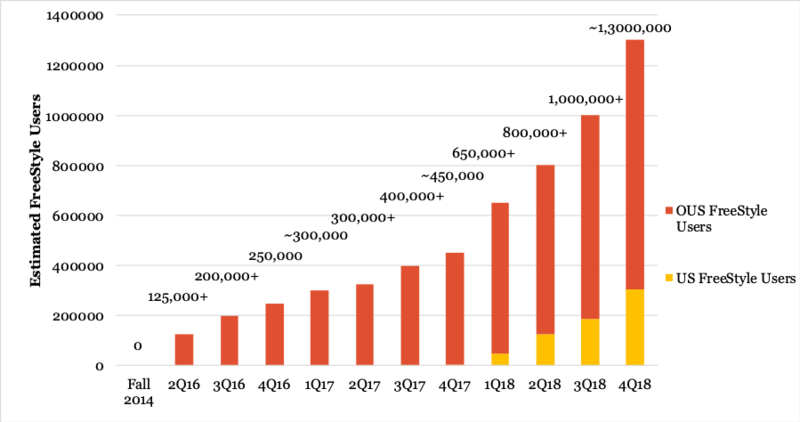 This performance came on an easier comparison to 6% YOY growth in 4Q17 and marked five straight quarters of consecutive YOY growth, including three straight quarters of YOY growth >35% - the US launch of FreeStyle Libre is hitting its stride. On a sequential basis, US sales increased 9% from 3Q18 sales of $124 million, breaking two consecutive quarters of double-digit sequential growth. In 2018, Abbott reported a record $457 million in US Diabetes Care revenue, up a whopping 38% on a moderate comparison to 2% growth in 2017. With FreeStyle Libre having been available in the US for just a little over a year, this is only the beginning of the US business’ rebound. Mr. White kept it brief on the recent FreeStyle Libre 2 European launch, mentioning only that rollout initiated “during the fourth quarter.” At JPM, Abbott CFO Mr. Brian Yoor shared that the Bluetooth-enabled CGM with optional, customizable hypoglycemia and hyperglycemia threshold alarms had officially launched in Germany (in line with October’s CE Mark), but at the time the “gradual European rollout” did not sound like it had commenced. Mr. White’s commentary left it unclear if a broader European rollout has already begun; we imagine a lot of capacity will need to be built for FreeStyle Libre 2. FreeStyle Libre 2 was listed #5 in the “Key Product Advancements” section of Abbott’s 4Q18 infographic, just ahead of the US 14-day FreeStyle Libre. While we’d be surprised if FreeStyle Libre 2 meaningfully accelerates demand – how many are waiting for alarms to get on Libre? Probably not many…. – it could make FreeStyle Libre more attractive for some patients at high risk of hypoglycemia. Given the recent Dexcom G6 launch in Europe, we’ll be very interested to see how adoption between the two devices plays out. For more on FreeStyle Libre 2, see our deep dive from October here. Although not mentioned on today’s call, Abbott announced in November that the FDA approved the FreeStyle LibreLink app for Apple iPhone 7 and later (running iOS 11 and later). The US Apple Store reflects a strong 4.4/5 star rating (189 total ratings), well ahead of 2.8/5 for Dexcom’s G6 (428 ratings). The apps are pretty neck-and-neck in terms of downloads, ranking #49 in and #52 in the iOS Medical category, respectively. At the time, Abbott told us that it will make Android apps available “as soon as we can,” but did not provide timing. This has been the historical cadence in US CGM – Apple first, Android after – though G6 and Eversense have most recently launched in the US with both out of the gate. FreeStyle LibreLinkUp, the dedicated remote monitoring app, was not included in this approval. Hopefully, we’ll see LibreLinkUp in the US soon, as we know that many caregivers in the EU, especially those with young children, have found it to be immensely helpful. No updates on the FDA submission for pediatric approval down to age 4 (confirmed on the 3Q18 call) were provided today. In the US, FreeStyle Libre is still only approved for 18+ years. In keeping with previous calls, Mr. White vaguely referenced efforts to further develop FreeStyle Libre, noting “the product obviously is getting all the emphasis in development, etc., that anybody would like to see” and “I think you can assume that we're obviously developing every aspect of this product that you can imagine, and that's all going very well.” In addition to receiving a US pediatric indication and approval for FreeStyle LibreLinkUp, we suspect these efforts also include development of a FreeStyle “Libre 3” with continuous communication for its pivotal with Bigfoot, now pushed back to 2H19 (see below). There was no direct mention of Abbott’s partnership with Bigfoot to develop a next-gen continuous communication CGM intended for automated insulin delivery with a pump (Loop) and MDI auto-titration with a Bluetooth-enabled pen cap (Inject). However, during Q&A Mr. White did mention that “all the things you would expect us to be doing, including working with other third-party partners who would benefit from this technology are all underway and have been for some time.” Earlier this month, we learned that the Loop hybrid closed loop pivotal trial is now expected to start in the second half of 2019, back from the previous goal to start in Q2 (which itself reflected multiple delays). The trials for Inject “will likely start in the second half of this year” too. On the plus side, both Bigfoot systems are still expected to launch in 2020, which remains doable, but is feeling more ambitious with each update. Importantly, the Loop and Inject systems will not use the current FreeStyle Libre 2 sensor: Libre 2 does communicate continuously with the reader to some extent should it need to alert the user of an out-of-range value, but it does not send and display the actual real-time glucose value unless the sensor is manually scanned. Such continuous sending of real-time values would obviously be a requisite specification for Bigfoot’s pump system. This means that Libre 2 could be tweaked to send packets of real-time glucose data, or that there could be an entirely novel “Libre 3” soon on the horizon. Given that the Bigfoot pivotal is slated to begin in 2H19, this “Libre 3” is presumably fairly far along in development at this point. Alternatively, the delayed start date could reflect delays in getting it ready (speculation). There are at least 47 active or recruiting studies on “FreeStyle Libre” or “Flash Glucose Monitoring” on ClinicalTrials.gov. Studies added or updated since October are highlighted in yellow below, as well as a selection of older studies that are just catching our eye. We’re excited to see yet another trial added to the roster of studies using FreeStyle Libre as a tool rather than investigating the sensor itself – the trial investigating early glargine (Lantus) in DKA management in children with type 1 diabetes seems particularly compelling. Q: I wanted to ask about FreeStyle Libre. You had another good quarter of patient add and it seems like you're expanding more into Type 2 with the new disclosure. Could you talk about the trends there, what the Libre 2.0 adds and some of your longer-term vision for Libre? Mr. White: First of all, it's going extremely well. We did add 300,000 patients last quarter. That's almost equivalent to the entire user base of the number two competitor in the space. We’ve got over 1.3 million patients now. Two-thirds of those are type 1. Our intent with this device has been to serve the entire diabetic community and not niche it, because we think it has mass market potential worldwide. We target both segments, both type 1 and type 2, and we're doing very well in the type 1 segment actually and as our capacity expands, we'll put even more effort behind the expansion with type 2 patients. There's a constant cadence of enhancements etc. to the product. We recently launched Libre 2 in Europe, and that should come to the US shortly. We've obviously invested a fair bit in capacity expansion. And at the rate we're adding patients, obviously that's something we started paying attention to couple of years ago, and I'd say, a significant quantum of capacity will come online in the second half of this year. From my perspective, that allows us to open the floodgate much wider. At this point, we're having a tremendous amount of success with Libre without putting much push behind it. And at that point, we're going to have an ability to turn on a lot of push. Then, we've got steady cadence of capacity additions after that. And because of the magnitude or the size of the diabetic market, both for type 1 diabetics and type 2 diabetics, our view was this had to have a value proposition for patients and for the healthcare system that was accessible and affordable by everybody, and not just driven by a rebate system and so forth. We've got a very low-cost position. We've got a good value access price point, and I think all of that is playing through our markets and our patient groups, and influence groups and so forth very well. The product obviously is getting all the emphasis in development, etc., that anybody would like to see. I think this is a very big, long-term, sustainable growth product for the company. I don't have any other way to say it. This is a half-and-half topic. Q: As you look forward in segmenting the market, you now have Libre 2 with alarms. You have a partnership with a pump company. Can you talk about how you might bifurcate your strategy to go after different segments, whether you need low-cost offering and a higher feature offering as you expand through the Libre portfolio? Mr. White: I think you can assume that we're obviously developing every aspect of this product that you can imagine, and that's all going very well. I wouldn't communicate what I would forecast as timelines. I think that the current growth rate speaks for itself. The current submissions and the features of the product that we're adding speak for themselves. We're pretty highly focused on bringing that capacity online not because we're constrained yet, but right now we're adding, as I said, 300,000 patients a quarter and growing. You have to pay attention to keeping that momentum increasing. And at this point, with that many patients and the magnitude of the opportunity, our intent is to make this very much a mass market product. But with 40 million type 1 diabetics out there, mass market means every one of those type 1 diabetics ought to be able to access this product economically, and that's worldwide. [Editor’s Note: This is an overestimate by some degree - assuming 5%-10% of the global diagnosed diabetes population has type 1, that translates to 10-20 million; the top-end is probably even an overestimate, given the significant growth in diagnosed type 2 patients globally. Of course, there's an enormous type 2 market beyond that. This is not a product that's targeted solely at type 1 or solely at type 2. Its accuracy and performance obviously have meaning and efficacy in all segments. Our cost position is as low as anything in the industry. We have probably number one cost position and the number one volume of patients position. I think we can pretty easily declare ourselves the leader in continuous glucose monitoring and are growing faster than everybody else. I'd just say that all the things that you would expect us to be doing, including working with other third-party partners who would benefit from this technology, are all underway and have been for some time. Q: So Abbott's guidance for 2019 is 6.5% to 7.5%, basically in line with 2018, and a bit better than the Street was expecting to start the year. So maybe you could give us a little background, what your confidence is at the starting point, and maybe specifically touch on some of the key growth drivers for 2019 that people are focused on, MitraClip; you talked about Libre, and maybe hit on Alinity. Mr. White: Libre as a story just gets better and better and better. So obviously, that's a pretty big and a high-growth driver, that's a good thing.